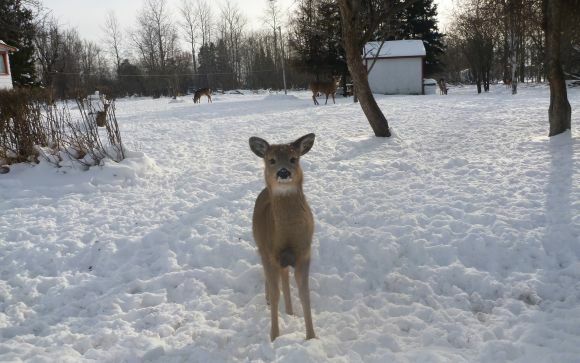 It was amazing to see the difference 6 months makes to the seasons in Canada. When I was last in Ontario, it was cold, snowing, and frankly, pretty painful. The scenery looked the same everywhere – white, cold and bleak. 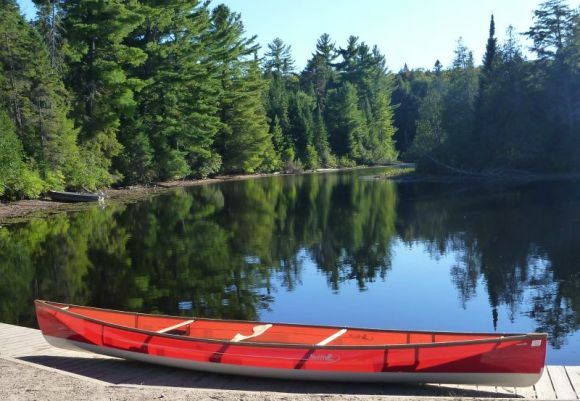 Having now returned at the end of Summer, the difference was astounding – lush green forest, early signs of the maples turning red, and brilliant sunshine radiating down on Canada’s many lakes. So here I was on my return to Canada, heading up the highway with a fair dose of jetlag and feeling more than a touch sensitive after a beer too many the night before with friends in Toronto. 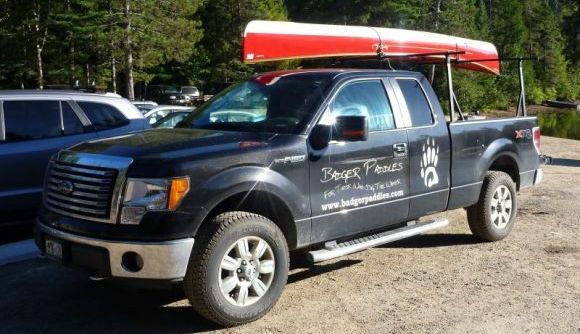 I was heading up to the Algonquin area to catch up with the crew from Badger Paddles when a truck caught fire on the highway and delayed us a few hours. Fortunately I had the good conversation of Gramma badger to keep me going until finally we caught up with Fiona and her Badger Mobile in Huntsville. 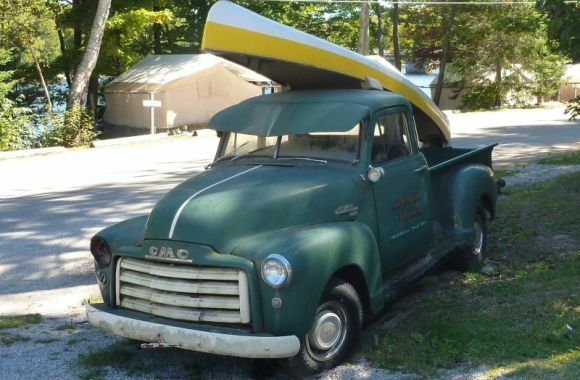 Then we were off to Algonquin Outfitters where I had the most beautiful canoe paddle thrust into my hands, and eventually into my baggage, for the return trip home! 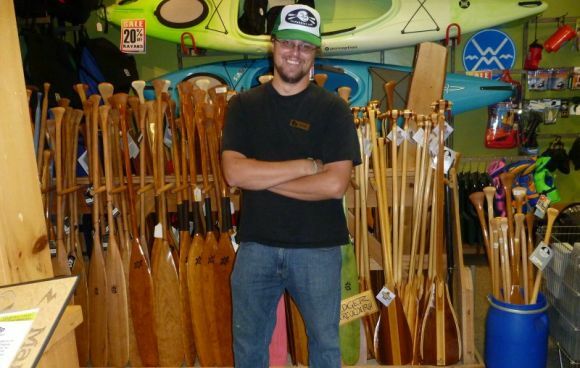 Randy from Algonquin Outfitters - and look at all those awesome paddles! 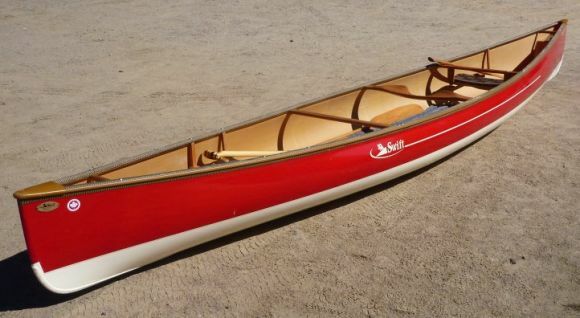 But I wasn’t here to shop, I was here to paddle, so we took off for Algonquin Park, stopping briefly to pick up a beautiful canoe kindly lent to us from Swift Canoes (where I got to meet Bill Swift, the President of Swift Canoes). Then we were off to the park itself, driving someway into it looking for a lake that wasn’t already crawling with paddlers. After 20 odd miles, we found ourselves at the put-in of Rock Lake, where we prepared for my first real paddle on Canadian water. The Swift Keewaydin canoe at the put in to Rock Lake. The weather gods couldn’t have delivered a nicer day. It was warm, sunny, and the lush forest looked beautiful as we slowly made our way into the lake. The wilderness here looked so different from Australian bushland but I was still drawn to its beauty. In many ways it felt to me like my visit to Alaska a few years prior – stunningly beautiful, but hiding dangers of the type we don’t usually face back home. That may sound strange coming from an Australian where the mantra at home is “if it moves, it can kill you”, but for us our dangerous creatures are small and injecty, not big and toothy (apart from our sharks of course!). 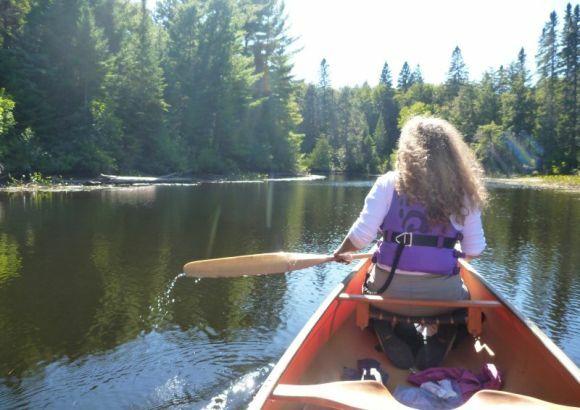 Could there be a more beautiful place to paddle? I call it "canoe nirvana". 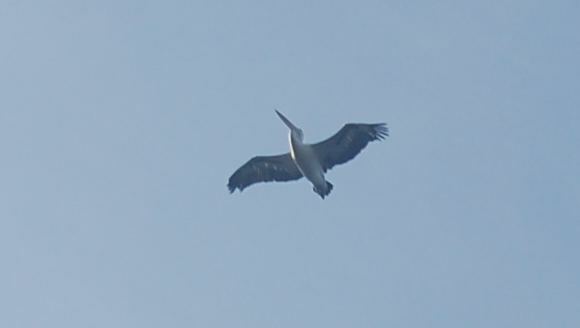 Of course we didn’t see any toothy furry animals, just a mix of beautiful bird life on the lake. 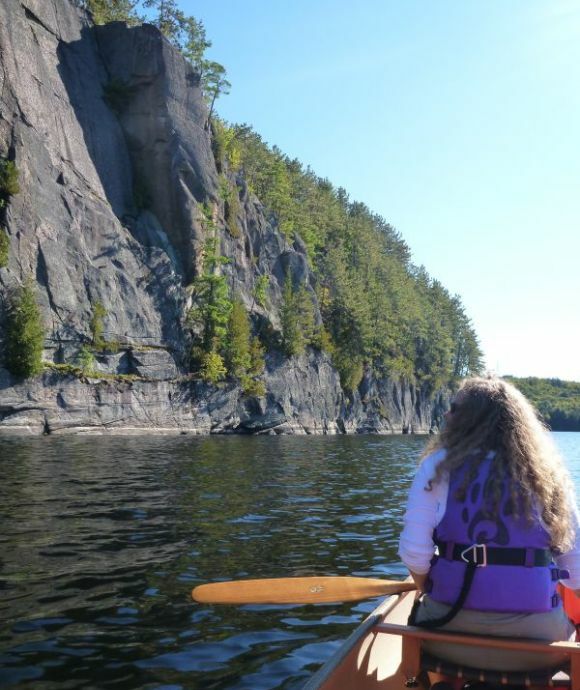 Loons and Herons played around us as we paddled our way from bay to bay, checking out the scenery until we finally made it to the impressive cliff that gives the lake it’s name. I have been told the rock itself has ancient native pictographs painted on it, but of course I wasn’t told this until after my visit, so didn’t manage to see any. It didn’t really matter though, the beauty of the place was quite enough. The incredible rock face at Rock Lake. Truly beautiful. The rest of the day became a bit of a blur as my jetlag started to give me a good kicking. We returned to the Badger Mobile and somehow ended up at some cabins nearby. Fiona’s husband Mike was waiting for us and before I knew it we were eating bbq’d steak and corn on the cob, sipping rum and ginger ale and having a good laugh. Then with my first day of travels behind me, I crawled into a bunk bed and promptly dropped into a deep, happy sleep. (To Be Continued). That Swift Keewaydin again. 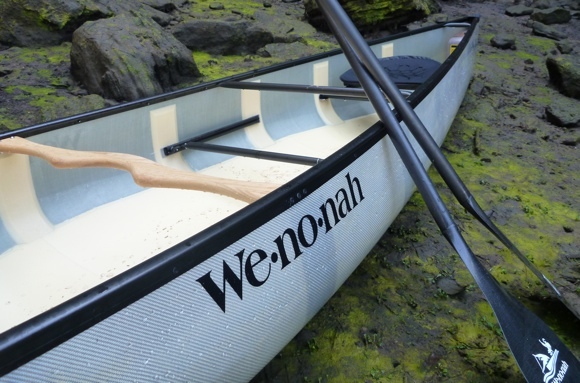 Such a beautiful canoe! 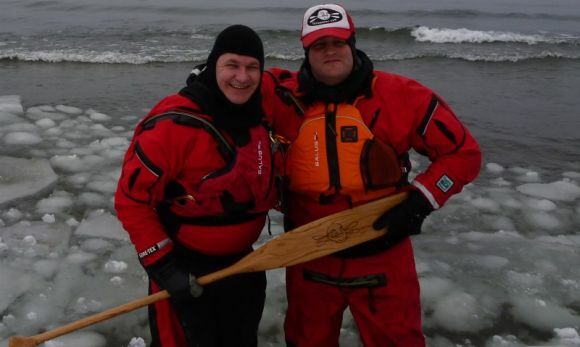 Extra special thanks to Fiona, Mike and Gramma from Badger Paddles for being my awesome hosts for the day. If you ever want to get a genuine feel for a place, it’s far better to hang out with locals, and these guys were brilliant hosts. Fiona also wrote this great blog post on my stay as well. Thanks again! Struth! What a gorgeous place to paddle. Sean, the link to Fiona’s blog post does not seem to be complete. ?? You refer to “Canada’s many lakes” which is certainly accurate but doesn’t half tell the story 🙂 The Canadian government’s official atlas says only that the total number is ‘unknown’, which I guess tells you something. Best estimate for my province of Ontario is 250,000. This sounds plausible — I can name at least 100 within a 30-minute drive of where I live, and Ontario is pretty big. Anyway, glad you enjoyed Algonquin Park. Love your blog, read it regularly. Tracy, thanks for that, have fixed the link.